Hate Cardio? 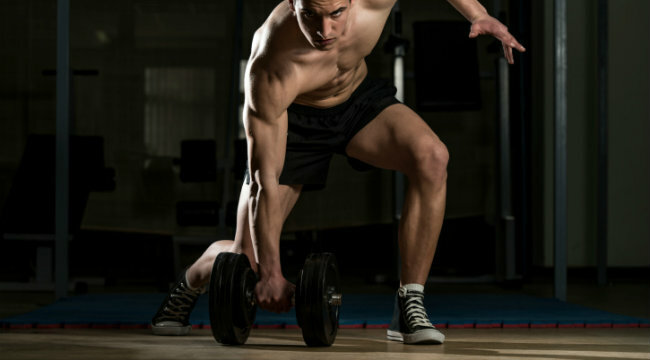 Try specialized weight training to burn big-time fat. Previous story The World Cup Workout Next story 60 Seconds to Fit - Are Decline Presses Worth It? For those of us who love to lift weights, cardio training is often an excruciatingly boring endeavor. Whether it be HIIT, steady state, or anything in between, when it is time to jump on the treadmill, stationary bike or elliptical the majority of us iron warriors cringe. But isn’t it this very type of mundane cardio that allows us to most efficiently burn off body fat and reveal the details of our hard earned muscles underneath? Not necessarily! Utilized correctly, the same BB’s, DB’s and machines we use to induce hypertrophy can also be extremely effective tools for melting fat. The key lies in choosing the right exercises, incorporating the proper rep range, and arranging your workouts in a manner that encourages the body to tap into body fat for energy. When utilizing weights to burn fat it is beneficial to perform mostly compound lifts, especially when it comes to larger muscle groups like back and quads. These movements will most effectively raise the heart rate, burn calories, increase natural growth hormone production (note: GH is a powerful fat burner), and enhance metabolic rate. Since we are focusing on burning body fat you want to keep reps in the medium to medium/high range, or about 10-12 for upper body exercises and 12-20 for the lower half. By doing so you will burn more calories, push out more lactic acid (which increases GH production), and stimulate the metabolism, while still giving your muscles a challenging enough workout to foster growth. Most of the time when concentrating our efforts into build pure muscle mass we utilize a “straight sets” approach, with 2-3 minutes rest in between. However, when looking to get “shredded” enough to display that wicked 6-pack and deep separations/cuts through every body part it is more effective to use specific types of supersets, circuits, and mega-fast paced training. The following workouts are examples of the types of weight training routines you can begin using right now to “rip up” your physique without ever stepping foot on a treadmill, bike or stepper. See the fat torching workouts on next page.